The Story of "The Old Man and the Sea"
"He was an old man who fished alone in a skiff in the Gulf Stream and he had gone eighty-four days now without taking a fish. In the first forty days a boy had been with him. But after forty days without a fish the boy's parents had told him that the old man was now definitely and finally salao, which is the worst form of unlucky, and the boy had gone at their orders in another boat which caught three good fish the first week. It made the boy sad to see the old man come in each day with his skiff empty and he always went down to help him carry either the coiled lines or the gaff and harpoon and the sail that was furled around the mast. The sail was patched with flour sacks and, furled, it looked like the flag of permanent defeat." - The opening paragraph from the critically acclaimed story, The Old Man and the Sea by Ernest Hemingway. "Think of what you can do with what there is"
With a seemingly endless selection of cuisines around the world, there's always something that makes a country, a region, a city, or even a neighborhood unique. At Santiago's, we're making the most of what there is by fusing Florida and St. Augustine's melting pot of cuisines, history and cultures into a menu that showcases what has made our city the destination it is today. Santiago's Florida Kitchen & Craft Bar is a contemporary take on everything that makes Florida dining great - a melding of culinary influences including the Spanish heritage of St. Augustine, Latin American and southern cuisines. Our wide selection of traditional dinner plates will satisfy your appetite for unique and eclectic tastes, but the main focus of our menu is our tapas-inspired, smaller, sharable-sized selections that allow the guest to experience an array of dishes. From fresh ceviche and seared ahi tuna, to shrimp and grits and the best burger on the beach, our menu is both comforting and exciting. Our bar features freshly prepared juices, local spirits and craft beers, award winning cocktails and beach-friendly libations alike. Inaugurated in 1984, the Great Chowder Debate is one of the longest-running chowder championships in the country. 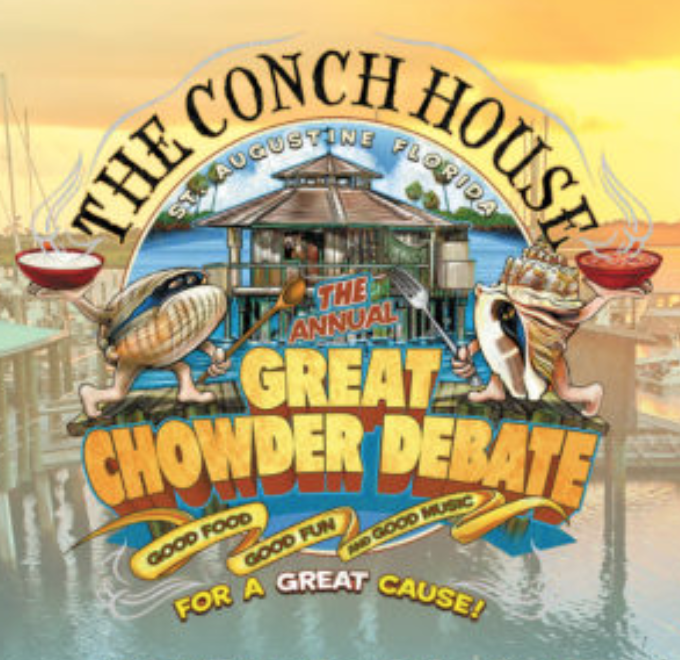 The Great Chowder Debate features over 5,000 patrons and over 2,000 gallons of chowder, served by some of the Florida’s best restaurants and chefs. Folio Weekly’s readers of influence select the top 250 people, places and things in the Nation's Oldest City.